It is fitting that I can think of no words to adequately describe The Arrival because the book has no words. 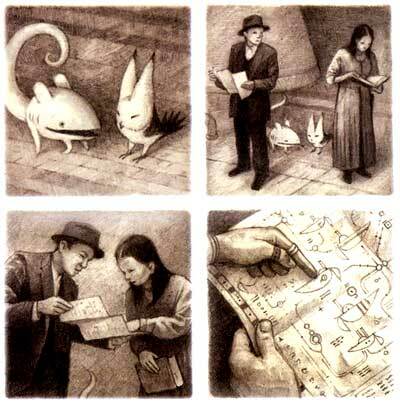 It is told entirely in beautiful drawings by Shaun Tan that are reminiscent of the silent film era. The Arrival tells the story of a man who leaves his home to make a new life for himself and his family on a distant shore. He arrives in the foreign country with no knowledge of the language, the culture, or the people. His loneliness is tangible, until he slowly makes friends and assimilates and learns that his new home holds friends and stories and enchantments, just as his old home did. I loved this story. I have begun to enjoy graphic novels more recently, but none of them made so clear to me until this one just how much depth and emotion can be conveyed through drawings. It seems silly, really. I enjoy visual art and paintings and think that they can convey great feeling. And I didn't doubt that graphic novels could. After all, I adored Blankets. But the drawings in this book are much more traditional and perhaps because they weren't sketches or only in black and white, they made a greater impression on me. I was enthralled by the pictures in this book as I don't think I have been since I was a child. This story has so much in it. It is the story of every immigrant to a new country. The man we follow does not understand the language. As you can see in the panel to the left, this made his immigration more of an ordeal as it may have been otherwise. 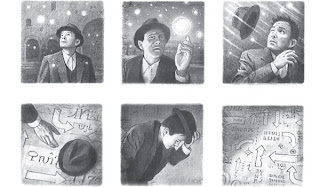 And I have never seen a hat used to more poignant effect than the hat in this book. See how he holds it and twists it in his hand there? Through the story, he loses it, fumbles for it, chases after it, is handed it, puts it on his head. It's as though he feels without his hat, he is not himself. And it is fitting that this book is told through illustration alone. Tan is masterful with it. There are different background tones for different time periods. Flashbacks have a more sepia color, whereas the present tense is in shades of gray. This adds to the silent film atmosphere. It also looks gorgeous! 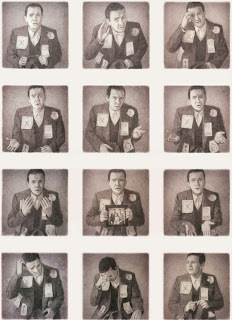 And as the characters do not have a shared language, they communicate through pictures, pantomimes and gestures. And, through this, friendships are formed. It's amazing to see the difference in the man's face when he makes his first friend. It is transformational, and so moving. Reading this book made me wonder how difficult it must be for so many people who move so far for a new life. Whenever I hear people say that people who move to America should all learn English, or that people should try to assimilate to European culture, or any phrase such as that, I always want to say, "But don't you realize what a courageous leap of faith it is to leave your family, your friends, everything you know to go somewhere that you don't even know the language? That someone must be so determined to make a different life for himself to become a complete stranger in a foreign land?" I think this book makes that so clear. People give up so much when they pack up and move. The loneliness in this book is palpable. And so any kindness shown, any overture of friendship, is so gratefully received, and so wonderfully appreciated that it makes you almost want to weep. I have gone through this whole review without really touching on the illustrations. I hope you can see for yourself with the panels how wonderful the illustrations are. They remind me of Chris Van Allsburg's children's books, like The Polar Express and Jumanji. He creates a fantastical place, with strange characters for language, wondrous forms of transportation and a completely new variety of animals and plants. It's steampunkish, in a way, but also shows just how foreign a new place can be. The drawings are beautiful. Truly, this whole book is lovely, and I hope if you see it on a shelf somewhere, that you grab it and sit down with it, and allow yourself to become immersed in its world. The Arrival is such a beautiful book. I first read it in the dark: I was using a computer in my university's library when the power went out. The emergency lights came on, but they were very faint. I wandered around the dark stacks, wondering what to do with myself, looking at the spines of books with my cell phone's blueish light. The Arrival caught my eye and I read the whole thing using my cell phone. Needless to say, I loved it and bought it within the month! This really does look like a beautiful book. I'd heard about it before, but a graphic novel with no words is what I kept coming back to it and I was never sure. But seeing some of the illustrations makes me a little more intrigued. What a lovely and thoughtful review - I must look for this! As an expat I am familiar with one tiny, tiny fraction of what the man in this book experienced, since I moved to a country that speaks the same language and has a very similar culture, but the experience of immigration/emigration is one that fascinates me. I had read a really good review over at Nymeth's site on this book, but reading yours just makes me want to rush out right now and grab a copy of this book. I just love the illustrations! They really seem to be very detailed, and almost as if they themselves are full of the feeling that the book engenders. I also love how the book tells such a poignant story with no words at all, and leaves the reader to express these things themselves. I, too, am always amazed by the immigrant experience of leaving your whole world behind to take a chance in a new one. This was a lovely review, Aarti. I am heading over to Amazon to check on this book!! Yes, Shaun Tan is amazing. He can draw so much emotion; he doesn't need words! But when he does use words, it is jsut as amazing. Get Tales From Outer Suburbia and see what he does when he marries his incredible art with words. It is outstanding. You made this book sound so amazing that it made me want to read it immediately. I do hope I get the chance to read it someday. The images you've "quoted" illustrated your comments on the beautiful imaginary very well. I think I would have to get used to reading a book without text, but you make it sound like it's absolutely worthwhile. Nisaba- That sounds like a really atmospheric way to read this book! I bet the cell phone light added another glow to the story. Clover- I think you should just give it a try. It won't take too long and it really doesn't NEED words. Marieke- I find the experience fascinating and very courageous as well. I think an expat would have some of the same feelings. Possibly even more so as they don't *expect* things to be so different. Shannon- This is my first Tan but I'm glad the others are good, too! Heather- Ooh, I will try to find it! Iris- Oh, I'm glad I had that effect on you! I hope you get a chance to read it as well. I am gutted that my library doesn't have this one, so I have had to console myself by ordering a different Shaun Tan book from the library. Ho hum! This book and author were recommended to me when I expressed an interest in beginning to read graphic novels. Your review describes it so beautifully. I think it is harder to convey things with pictures and to sustain that feeling of emotional involvement in a story with no written words. The pictures you have shown are incredible. I can only think of my grandfather who left Switzerland to come here, the only one in his family who made the journey. He was almost 90 and on his death bed when he told me so many stories about what it was like to come here and feel like a stranger. I can't imagine. Thanks for sharing about this book. I think many people don't realize how much graphic novels have to offer but I imagine your review will change their minds. 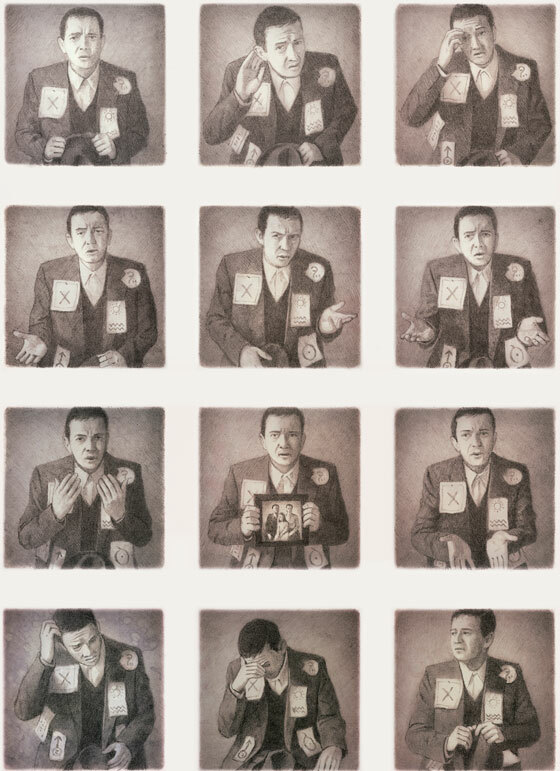 I loved how each picture, and how groups of pictures conveyed so many things. I never thought a picture can tell a lot! Loved this book. I am so glad you loved this book! I have gushed about it so many times over the last few years since I read it, and I can't stop gushing! Just this week I guest posted at BethFishreads and shared a video of a dance adaptation of this book which was pretty good too! Vivienne- Let me know how you like the one you read! I haven't read anything else by him. Kathleen- I think the way that you imagine your grandfather is the way I imagine my parents. Luckily, they were fluent in English when they came but it was a huge culture shock. Aths- Yes, I remember seeing your review! Marg- I saw that! I looked at both videos you shared. This is such a great review of a great book, Aarti! You point out everything I love about this book. It really is the epitome of why graphic novels are so wonderful. How pictures can tell a story just as eloquently and as meaningful as words. Especially here...where an immigrant can sometimes not use words as communication. I just loved it so much. I loved your review! This book looks amazing! I'm going to have to check it out! I remember really enjoying The ARRIVAL. I don't think of it as a graphic novel, though, just a wordless book. I don't know where the distinction is. It's just so different from any others! Chris- Thank you! I loved it, too. Carrie- I hope you do! It's very good. Rebecca- I can see that. I don't know where the distinction is, either, though! Great review, Aarti! I think the same thing when I hear people say that all immigrants should learn English. It's like "what? Have you ever tried learning another language? Do you understand how hard that is?" I think The Arrival is such a great book. There aren't many books like it. Your review made me even gladder I borrowed this one from the library! Emigrating must be a terrifying experience but it´s really only appreciated by few. I think most people who complain about immigrants are those who have never been outsiders. "...but none of them made so clear to me until this one just how much depth and emotion can be conveyed through drawings." I actually can't think of any other book that makes that as clear as The Arrival. I'm so glad you loved it - and I loved your post. I so agree with everything you said. 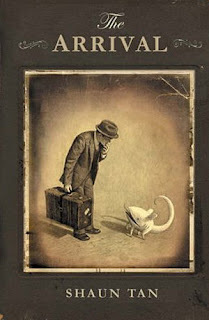 It's the book that made me worship Shaun Tan. He's amazing. I love the insights you gave us about the use of hat and the sephia color for flashbacks (I never noticed those actually!). Lovely. The Arrival is a true immigrant story, THE book to read to understand what it's like to be a stranger in a strange land. I really need to read this book. I have read his others, so this would finish it off. This is one of my very favorite books of all time. <3 It came into my life shortly after I moved away from my family to go to grad school. Even though I've never journeyed to live in another country, this was exactly the right book for me as I became acclimated to my new home. Thanks for the eloquent review!